The mains and rods are. 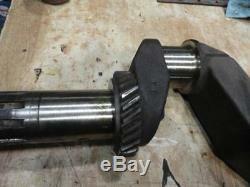 John Deere Late A Crankshaft Reground. 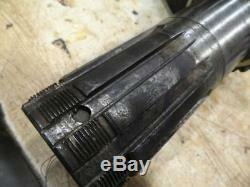 Part number on the crankshaft is A3322R. 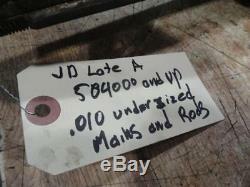 Used on john deere A after 584000. 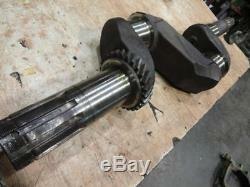 This is a fresh ground crankshaft. Parts Inquiries and General Questions Welcomed! Styled A B G 50 60 70 520 530 620 630 720 730. ALL INVENTORY IS NOT LISTED ONLINE PLEASE CALL. Be sure to add me to your favorites list. Auctiva offers Free Image Hosting and Editing. 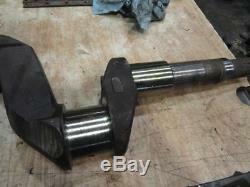 The item "John Deere Late A Crankshaft Reground A3322R ready to go" is in sale since Tuesday, October 30, 2018. This item is in the category "Business & Industrial\Heavy Equipment, Parts & Attachments\Heavy Equipment Parts & Accessories\Antique & Vintage Equipment Parts". The seller is "millertractoron480th" and is located in Kalona, Iowa. This item can be shipped worldwide.